Mcgarrity & Moser opened its doors in 1946 as a Dodge Dealership. 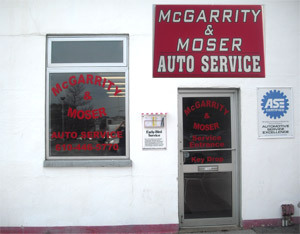 From 1946 to 2005 McGarrity & Moser was a well respected car dealership, and always provided great auto repair service. Since 2005 McGarrity & Moser no longer sells new vehicles, but they have used the space to expand their auto repair services. With more than 60 years of experience as a Dodge dealer they have a ton of experience servicing these vehicles. Now that McGarrity & Moser focuses only on car repair they service all types of vehicles. Our repair services for imported manufactures like Honda and Toyota are just as good as domestic manufacturers like Ford and GM. Our ASE certified auto mechanics have all the latest equipment and education to diagnose today’s complex computerized vehicles right the first time and get you back on the road. The old dealership building and service department leaves plenty of space for a comfortable waiting area, and plenty of on site parking. Try our auto repair shop for your next oil change, state inspection, or repair service and see what we are all about.